Happy Deaf History Month! This month, as we are celebrating the milestones and historical successes among the deaf community, I wanted to find an appropriate book out there that makes hearing impairment accessible to children. Leave it to singer/songwriter/activist extraordinaire Pete Seeger to rise to the occasion. 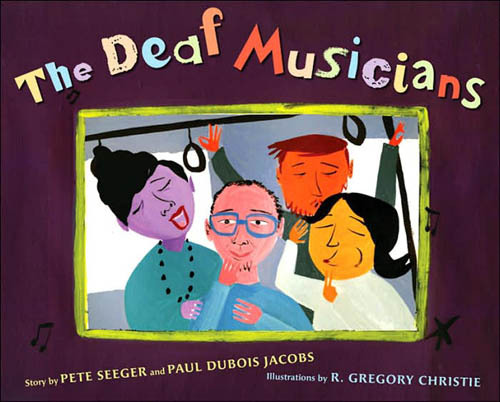 Pete Seeger and Paul Dubois Jacobs have teamed up with the amazing illustrator Gregory Christie for The Deaf Musicians – the tale of what happens to a jazz musician when he loses his hearing. When Lee suddenly is unable to hear his fellow musicians’ notes and riffs, he is asked to leave the band. But despite this moment of despair, Lee manages to find another way of fulfilling his musical passion at a school for the deaf. There, he comes to find a new community, a new kind of music and a new lease on life. The be-bop, lyrical text of this wonderful book perfectly matches Christie’s almost retro-feeling illustrations – and together they weave a tale of hope and love and, ultimately, the spirit of music in its many forms. This is a fantastic book to approach the subject of hearing loss with children in a sensitive and uplifting way – and is a great read to celebrate this important month.